It was manufactured by the C. Lorenz company, its basic design goes back to mid 1930s. 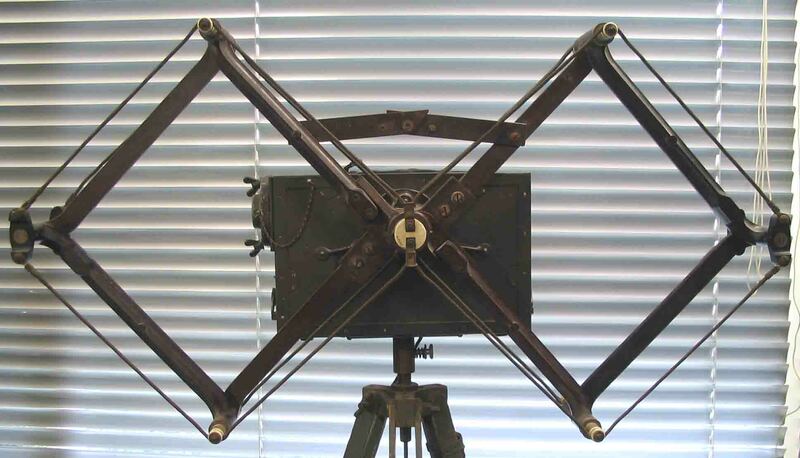 The sawtooth like antenna arrangment (double rhombus, consisting of a director (nearest to us) and a reflector plane section), was based on the Chireix - Mesny antenna configuration (concider: Hollmann on this subject). In contrast to what one would think on the first hand, its antenna polarisation is but vertical! When two sets were employed near to each other, one polarisation plane could be rotated 90 degrees, hence transmissions would be then horizontally polarized. The left hand ceramic plate represents the transmitter stage (S = Sender); right from it we see the receiver section (E = Empfänger). Both are employing Lorenz acorn valves (tubes) type DS310 (designation is just visible). The receiver was rather sensitive, because it was based on the super-regenerative principle. They did not utilize a separation stage between generative receiver front and antenna circuit, they might have considered that on these "ultra high" frequencies, this did not matter too much. Gerät-Nr. 124-4501A (drawing number); Werk-Nr. 20111-42 (serial (production) number - manufactured in 1942) However, these kinds of serial numbers are actually masking the real production figures, but it is quite realistic to estimate that its serial number is 111. Hersteller does mean: the manufacturer. The designer of a system, does not necessarily imply that they actually have produced it. 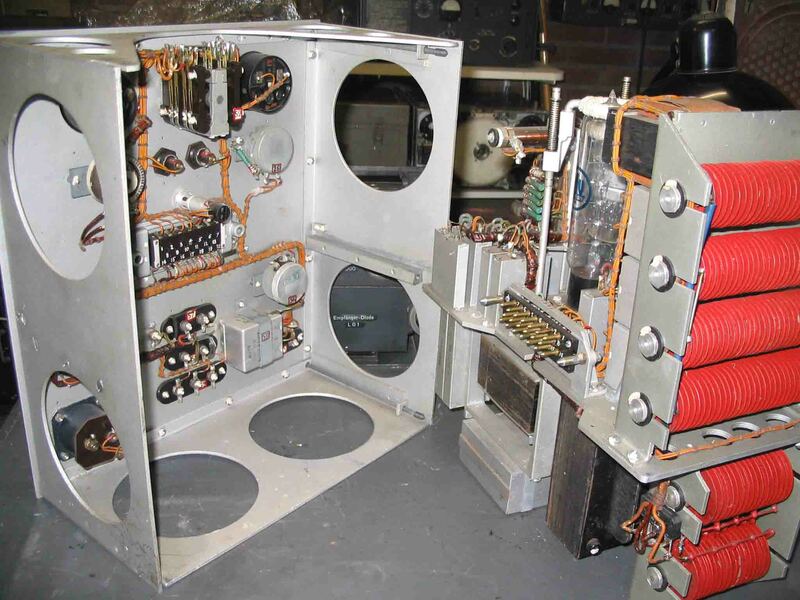 The two very neatly built sections show: on the left hand the main chassis with the wiring of the front panel. 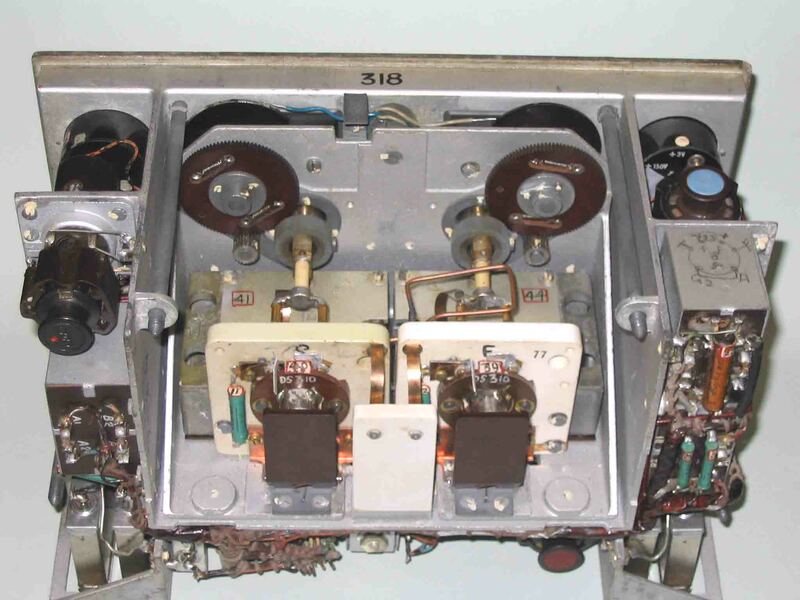 On the right, the power supply frame carrying various bridge rectifiers (red discs) for low and high tensions. This photo shows a nice example of proper construction. 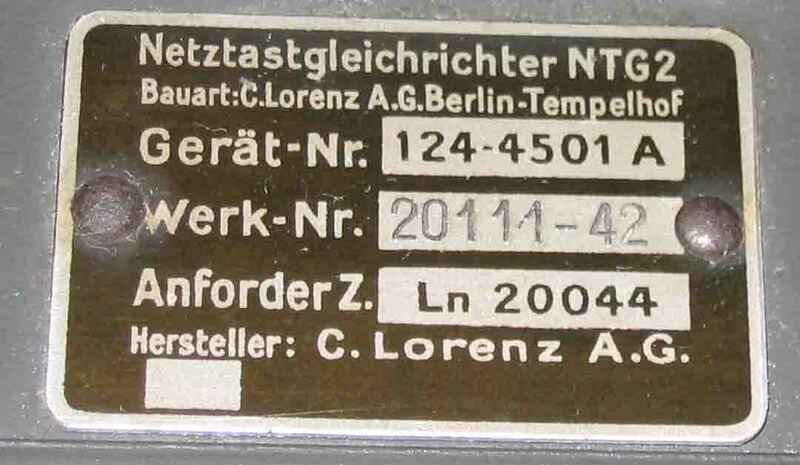 This module, although its type number plate suggest differently (see previous photo), was actually manufactured by LMT in France. For some time, this type of equipment had been employed in the "Festung Breslau", during the final months of the war, in 1945 (fortress city of Breslau; since summer 1945 Poland, is called now Wroclaw). 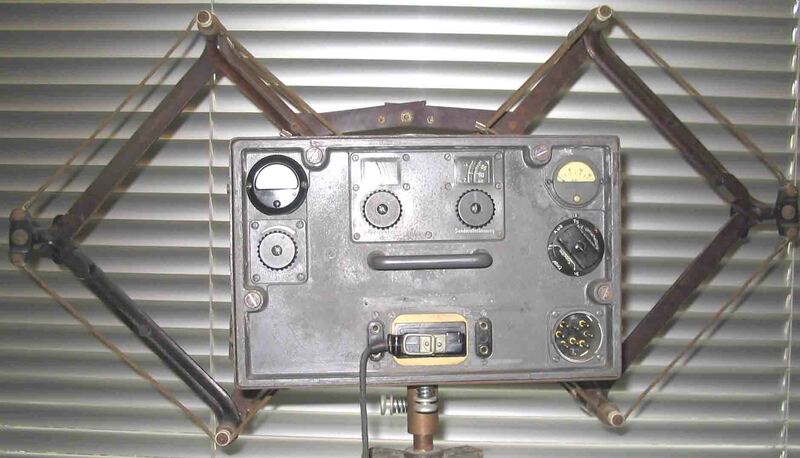 Elster apparatus was the only communication gear between those inside Breslau and the German military services outside. The Russians concluded, after due investigations, that there must exist communication between the in- and outside German services. Russian interception services could not, however, find German wireless traffic. They suggested, that the only logic explanation was, an existing hidden telephone line connection. They decided to dig a deep trench around the city of Breslau, as to disrupt any cable connection. 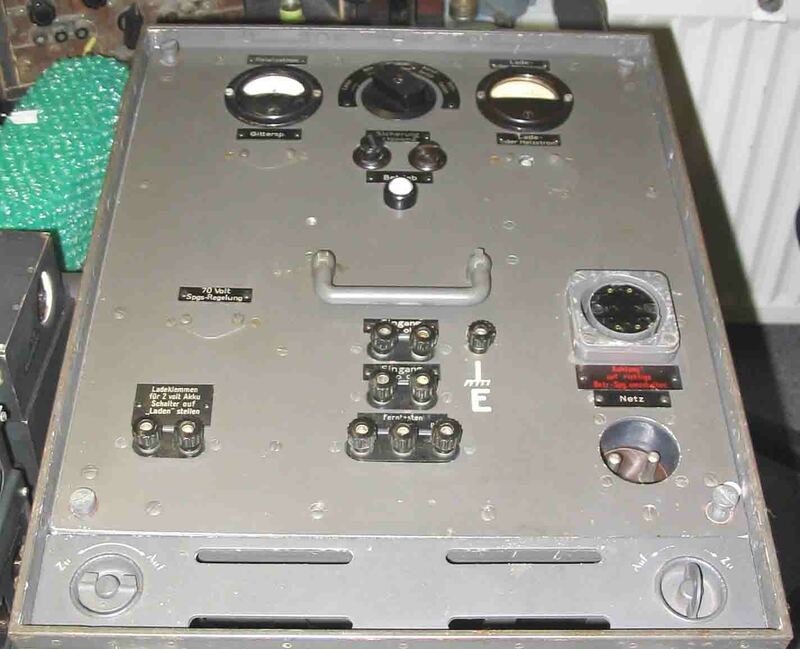 What they didn’t were aware of was, that the Germans used an, Ultra High Frequency, Elster DMG2T set, placed on the roof of the main Post Office building. The German station on the other end of the line was erected in the mountains, about 125 km away from Breslau (territory then still held by the German armed forces).